A few weeks ago, I had one of my frequent trips to MIT for work. In addition to my actual work, I look forward to these trips since they give me a good chance to check out places to eat. My actual destination was Brookline Lunch, a nice little diner joint a half block off of Mass Ave in Cambridge with some above-average diner fare. I had eaten there a few years back sans camera, and wanted to go back and try them out for an actual review. Well, Brookline Lunch is closed on Tuesdays, so instead I decided to check out a nice looking place I passed while walking to Brookline, Cafe Luna. 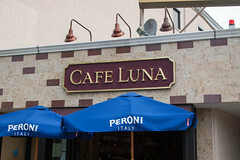 Cafe Luna is a modestly-sized joint just a few doors down from Toscanini’s, and they’ve got the basic “breakfast joint” menu down pat, with breakfast all day and a smaller lunch menu (aside from special events, they aren’t open for dinner). 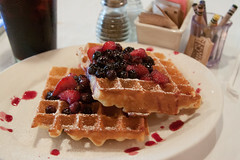 But there are two things that really grabbed my attention right away: the iced coffees, and several people ordering up various waffles and French toast covered with fresh berries. I’ll start with the coffee. While the Boston area has no shortage of good coffee places (one of my favorites, Dwelltime), is only a few minutes’ walk away), Cafe Luna goes afar for their coffee, bringing in coffee from Blue Bottle, who I first discovered in San Francisco. 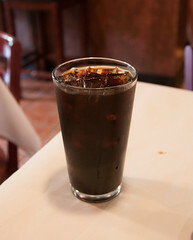 Most importantly, they offer up Blue Bottle’s New Orleans-style Iced Coffee with Chicory, which makes for a particularly pleasant iced coffee. And all the various plates rushing out from the kitchen covered in fresh berries made me order the Belgian Waffle with berry compote, and this was a particularly pleasant breakfast: a very rich and crispy waffle with a fluffy interior, and the compote was rich in fruit flavors without being either too tart nor too sweet. Overall, a very satisfying breakfast served in a nice cafe setting by a pleasant staff. I’d love to come back and try lunch.